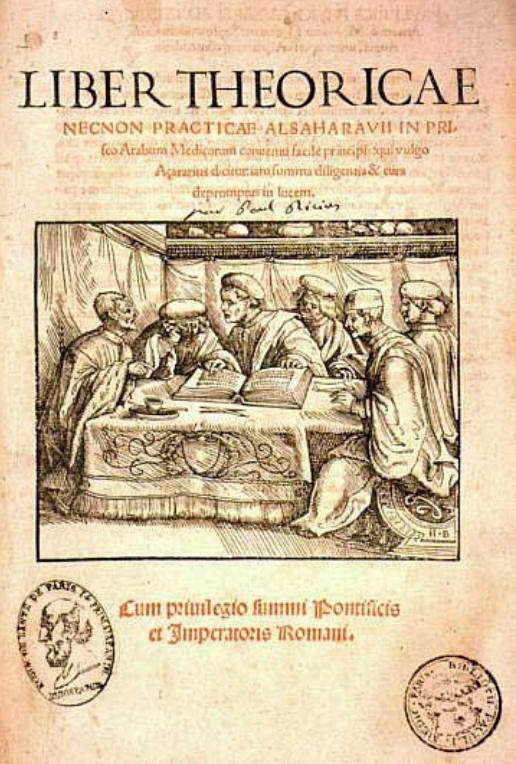 This article presents Abu'l-Qasim Khalaf ibn 'Abbas al-Zaharawi, Arabic أبو القاسم خلف بن عباس الزهراوي, Latin Albucasis (936-1013 A.D.), one on the most outstanding Arabic physicians and the most remarkable Arabic surgeon. His work had a strong impact in middle ages. Greek-Roman surgery had almost ceased to be practiced, in the Western world, after Paul of Aegina (625-690 A.D.), the last Byzantine compiler. Albucasis took for himself the task of making of surgery an honorable art. He recovered ancient surgical texts from damaged scrolls, developed, expanded and refined Greek-Roman operations, adding his own pioneer techniques, procedures, and devising his own instruments. His clear and insightful teachings laid the foundations of accurate and safer surgical procedures that were adopted in the following centuries. With us was a Doctor, a Physician; for skill in medicine and in surgery there was no peer in this entire world. He watched sharply for favorable hours and an auspicious ascendant for his patients treatment, for he was well grounded in astrology. He knew the cause of each malady, if it was hot, cold, dry or moist, from where it had sprung and of what humor. He was a thorough and a perfect practitioner. Having found the cause and source of his trouble, quickly he had ready the sick man's cure. He had his apothecaries all prepared to send him electuaries and drugs, for each helped the other's gain; their friendship was not formed of late! He knew well the old Aesculapius, Dioscorides and Rufus, Hippocrates, Haly and Galen, Serapion, Rhasis and Avicenna, Averroes, Damascene and Constantine, Bernard, Gatisden and Gilbertine. His own diet was moderate, with no excess, but nourishing and simple to digest. His study was only a little on Scripture. He was clad in red and blue-gray cloth, lined with taffeta and sandal silk. Yet he was but moderate in spending, and kept what he gained during the pestilence. Gold is a medicine from the heart in physicians’ terms; doubtless that was why he loved gold above all else." Albucasis was not the only Arabic doctor who wrote on surgery. Two of the most outstanding Arabic doctors also wrote on surgery. Rhazes, Abū Bakr Muhammad ibn Zakariyyā al-Rāzī (865-925 A.D.), a physician, alchemist and philosopher, born in Iran, also wrote on surgery in his book Al–Manṣūrī fī 'ṭ–ṭibb (chapter VII). The work was translated into Latin as Liber medicinalis Almansoris by Gerard of Cremona (c.1114-1187), an Italian scholar who worked in Toledo and translated scientific books from Arabic into Latin. Rhazes took advantage on his expertise on alchemy, and used alcohol, which he distilled for the first time, as an antiseptic, in his unguents for surgical wounds. He also used opium as an anesthetic and analgesic (Rhazes, 1497, pp. 30-35). Avicenna, Abu 'Ali al-Husayn ibn-Sīnā (980-1037 A.D.), born in Persia, was a philosopher, a doctor, a poet, and the leading figure the Islamic Golden Age. In his medical treatise, Canon of Medicine, he included surgery amongst diet and use of simple and compound medicines (Avicenna, 1507). He presented minor and major surgery which he drew from Greek-Roman authors, adding his own experience and insights. He used sedatives, anesthetics and paid special attention to ophthalmology. However, surgery occupies a small place in his treatises (Sanagustin, 1986, pp. 84-112). Abu'l-Qasim Khalaf ibn 'Abbas al-Zaharawi, Arabic أبو القاسم خلف بن عباس الزهراوي, known in Latin Europe as Albucasis, Bucasis and Alzaharavius (936-1013 A.D.), was born of Spanish parents at El-Zahra, near Cordova, in Spain. There is little material on his biography. His most outstanding work was Altasrif, an encyclopedia of medicine and surgery, consisting of two parts, and each of fifteen sections. He borrowed from Rhazes parts dealing on anatomy, physiology and dietetics, with little original material (Campbell, 2006, pp. 85-86). Galen was the main source on these matters for these authors. His books were translated into Arabic. A manuscript from the ninth century, translated into German by Max Simon (Simon, 1906). Previous descriptions of embriotomy do not mention preoperative clinical assessment. Neither the treatise that usually comes along with the Hippocratic Corpus (5th- 4th century B.C. ): “On extraction of the dead foetus” (Coxe. 1846, pp. 321-323), nor the writings by Celsus (c.25-c.50 A.D.) (Celsus, De Medicina VII, 29 in Hendersen, 1938, II vol, pp. 455-61). The tonsil guillotine and its use (II, 36); the concealed knife and its case for opening abscesses (II, 46 and fig. 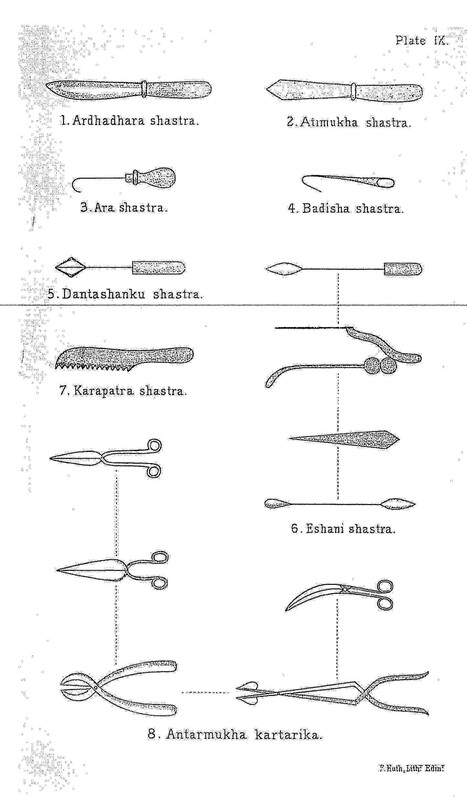 12); the trocar for paracentesis (II 54); the possibility that Albucasis or his contemporaries invented true scissors (II, 57 and several figures); the syringe (II, 59); the lithotrite (II, 60); and his design of vaginal speculum (II, 77). This chapter on gynaecological instruments gives reason to for thinking that Albucasis anticipated Chamberlain’s obstetric forceps, though not for a live delivery. Then there is the use of animal gut as suture material (II, 85); the description of, possibly, thrombophlebites migrans (II, 93); the well-illustrated account of the reducing table for extending limbs in order to reduce dislocations or displaced fracture ends (III, 31); and the formula for a kind of plaster casing anticipating the modern plaster cast (III, 27)"
You should know that dental instruments are very numerous, as are the other instruments, almost beyond reckoning. And the experienced worker with a knowledge of his craft may devise fresh instruments according as his work on actual cases suggests them to him." Figure 5. Albucasis, Chirurgia Albucasum, Illumination 14th century, Folio 34 recto, Collection: Wellcome Images, British Museum Add. Ms. 36617; Wellcome M0004103). 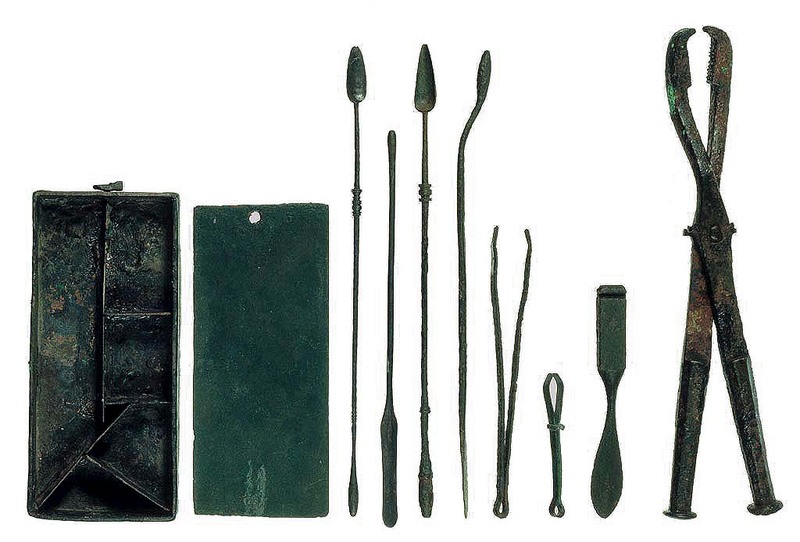 Roman scalpels usually present a leaf-shaped plain leaf-shaped spatula, used as a blunt dissector (Figure 6 - Provenance: unknown. Copper alloy, Length: 84mm, Bus 54. Courtesy 0f the Lisbon National Museum of Archaeology.). 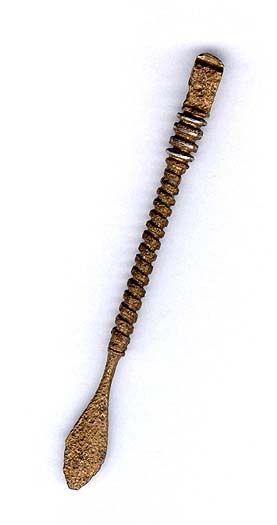 Greek-Roman instruments were not provided with mandrels. Adams, F., The Seven Books of Paulus Ægineta, translated from the Greek with a commentary embracing a complete view of the knowledge, III volumes, Sydenham Society, London, 1846. 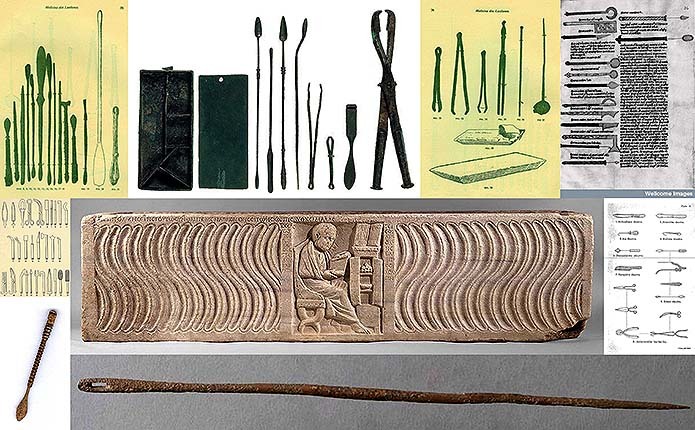 Arslan et al., Albucasis: Founder of Catgut, “Acta Medica Anatolia”, Volume 2, Issue 3, 2014, pp. 103-104. Alves, F., Raposo, L., Santos, A. (Org. ), Um gosto privado/Um olhar público, Doacções D. Luís Bramão, Bustorff Silva, Barros e Sá, Instituto Português de Museus/Museu Nacional de Arqueologia, Lisboa, 1995. Avicenna, Liber canonis, Venedig 1507 (Nachdruck Olms, Hildesheim 1964). 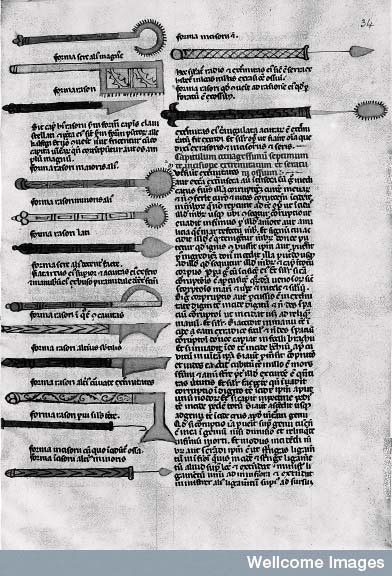 Campbell, D., Arabian Medicine and its Influence on the Middle Ages. Martino Publishing, Hertford, 2006. 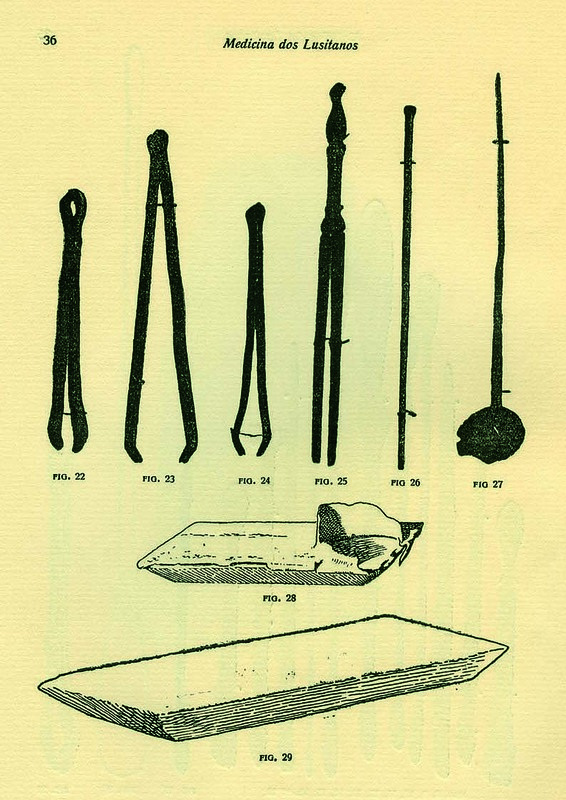 Bliquez, L.J., The tools of Asclepius. Surgical Instruments in Greek and Roman Times, Brill, Leyden, Boston, 2016. Boudon-Millot, V., Un traité perdu de Galien miraculeusement retrouvé, le Sur l’inutilité de se chagriner, in La Science médicale antique: Nouveaux regards, V. Boudon-Millot, V & Joanna, J., Galien, vol. 4, Ne pas se chagriner (Paris: Les Belles Lettres, Paris. 2010. Cambra, L.M.A., Un Tratado de Odontoestomatologia en Abulcasis, Universidade de Almería, Servicio de Publicaciones, Amería, 2003. Coxe, J. R., The writings of Hippocrates and Galen, Lindsay and Blakiston, Philadelphia, 1846. Celsus, On Medicine, Henderson, J. T. (ed. ), Spencer, W.G. (transl. ), Harvard University Press, London, III Volumes, 1938 (III vol.) II, p. 49. Chauliac, G., La grande chirurgie de Guy de Chauliac, chirougien, maître em médicine de l’Université de Monpellier à l’an de 1363, Paris, Alcan, 1890. Dude, L., Extrakionszangen der römischen Kaiserzeit, Dissertation zur Erlangung des Doktorgrades der Zahnmedizin des Fachbereichs Medizin der Johann Wolfgang Goethe-Universität Frankfurt am Main, 2006. Engeser, M., Der “Liber Servitoris” des Abulkasis (936-103), Ubersetzung, Komentar, Nachdruck der Textfassung von 1471, Deutsher Apotheker Verlag, Stuttgatt, 1986. Gurlt, E., Geschichte der Chirurgie und ihre Ausübung, Verlag von August Hirschwald, Berlin, 1898, 3 Bänder. Jee, S.B.S., A Short History of Aryan Medical Science, Macmillan and CO., New York, 1896. 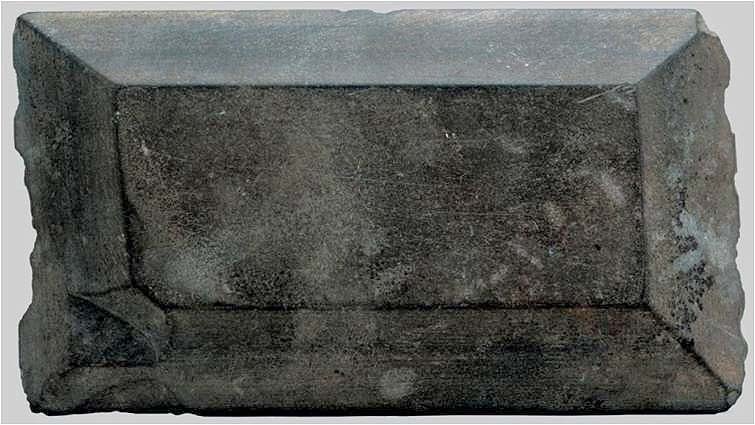 Kenrick, J., Roman Sepulchral Inscriptions. Their relation to Archeology, Language, and Religion, London, York, 1858. Künz, E., Medinizinische Instrumente aus Sepulchralfunden der römischen Kaiserzeit, Rheinland Verlag GmbH, Köln, 1982. Künzl, E., Medizin in der Antike. Aus einer Welt ohne Narkose und Aspirin, Theiss Verlag, Stuttgart, 2002. Leclerc, L., La Chirurgie d’Albucasis, Paris, 1861. 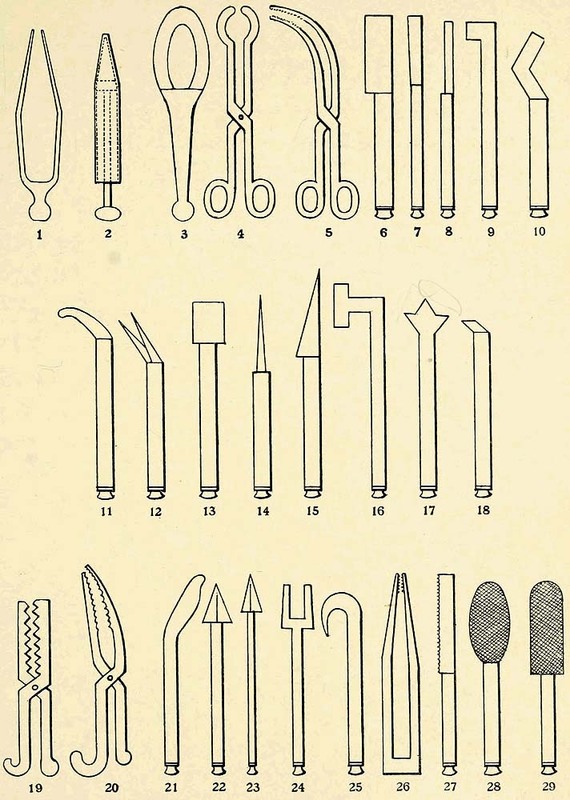 Milne, J. S., Surgical Instruments in Greek and Roman Times, Clarenden Press, Oxford, 1907. Nasr, S. H., in Avicenna, The Cannon of Medicine (al-Qanun fil-tibb), Bakkiar, L, (adapt. ), reat Books of the Islamic World, Inc., Chicago, 1999. Pliny, Natural History, H. Rackam (transl. ), Harvard University Press, Cambridge, 1952. Rhazes, M, Maimonides, M, Liber ad Almansorem […], Bonetus Locatellus, O Scotus, 1479. Ricci, J. V., The Developement of Gynaecolocogical Surgery and Instruments, Blakiston, Philadelfia, 1949. Ricci, J. V. (1950) – Aetios of Amida, The Gynaecology and Obstetrics of the VI Century, A. D., translated from the Latin Edition of Cornuarius, 1542, Philadelphia, Toronto: The Blackiston Company. Sanagustin, F. “La chirurgie dans le Canon de la medecine ("Al-Qânûn fi-ṭ-ṭibb") d'avicenne ("Ibn Sînâ")”, Arabica, T. 33, Fasc. 1 (Mar., 1986), pp. 84-122. Simon, M, Sieben Bücher Anatomie des Galen: zum ersten Male veröffentlicht nach den Handschshriften einer arabischen Übersetzung des 9. Jahrh. n. Chr. /ins Deutsche übertragung und kommentiert, J. C. Hinrichs'sche Buchhandlung, Leipzig, 1906. Spink, M.S. 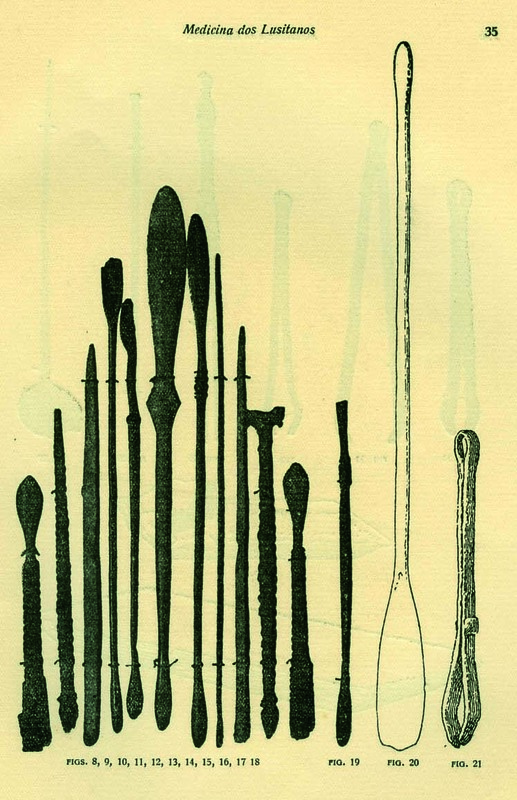 & Lewis, G.L., On Surgery and Instruments. A definitive edition of the Arabic text, English translation and commentary, Wellcome Institute of the History of Medicine, London, 1973. Temkin, O., Soranus’ Gynecology, The Jihn Hopkins University Press, Baltimre and London, 1956. Tschanz, D. W., A short History f Islamic Pharmacy, “Journal of the Internatina Society of Islamic Pharmacy”, 2003, 1, pp. 11-17. Vasconcellos, J. L., Barroso, M. S. (Introd. ), Medicina dos Lusitanos. Celom, Lisboa, 2008. Velensky, R., Albucasis: Un Chirurgien Arabe Au Moyen Âge –Primary Source Edition, Thèse pour obtenir le grade de Docteur en Médicine, Monpellier, 1908. Walsh, J., Medieval Medicine, A. C. Black, London, 1920.